40 / the tasting panel / january/february 2017 PACKAGING Rosé Is the New "Black" In 2017, Black Box's limited edition Rosé, the eleventh product in the portfolio, was born out of rosé's exponential growth in the U.S. wine market over the past few years, including 43 percent growth last year. "We saw an opportunity to bring this phenomenon into boxed wine, in time for 2017's warm weather seasons," continues Schoenberg. "This California Rosé, made in the traditional saignée method, is built around Syrah, and its flavor profile is slightly dry, with some white aromatic blenders to lift the nuances of the crisp tones, including fresh strawberry and white peach." W hen Black Box Wines launched in 2003, it dared to chal- lenge consumers' notions about what box wine was and shifted the focus to what box wine could be. According to Jaymie Schoenberg, Vice President of Black Box Wines, 40,000 cases were sold in its first year. In 2016, sales surpassed 5,000,000 cases. Although Black Box is now the number-one brand in the premium box wine category and holds a 33 percent share of this growing market, premium box wine still has only four percent market share of the overall wine category. Schoenberg, nevertheless, sees the wine glass as more than half full, as there are plenty of opportunities to persuade bottle wine drinkers to open a Black Box. 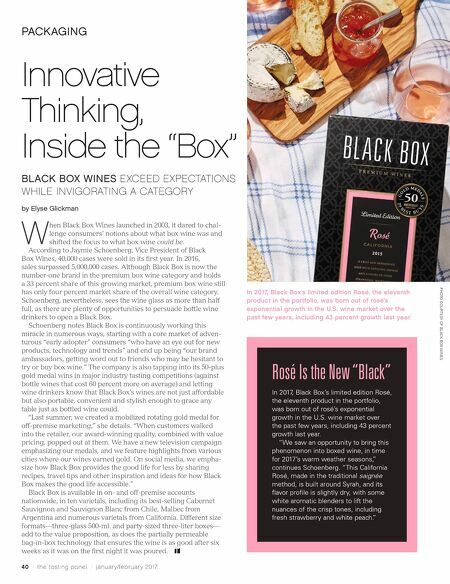 Schoenberg notes Black Box is continuously working this miracle in numerous ways, starting with a core market of adven- turous "early adopter" consumers "who have an eye out for new products, technology and trends" and end up being "our brand ambassadors, getting word out to friends who may be hesitant to try or buy box wine." The company is also tapping into its 50-plus gold medal wins in major industry tasting competitions (against bottle wines that cost 60 percent more on average) and letting wine drinkers know that Black Box's wines are not just affordable but also portable, convenient and stylish enough to grace any table just as bottled wine could. 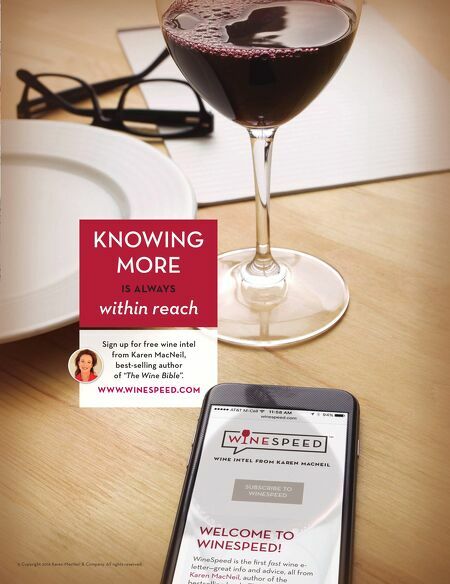 "Last summer, we created a mobilized rotating gold medal for off-premise marketing," she details. "When customers walked into the retailer, our award-winning quality, combined with value pricing, popped out at them. We have a new television campaign emphasizing our medals, and we feature highlights from various cities where our wines earned gold. On social media, we empha- size how Black Box provides the good life for less by sharing recipes, travel tips and other inspiration and ideas for how Black Box makes the good life accessible." Black Box is available in on- and off-premise accounts nationwide, in ten varietals, including its best-selling Cabernet Sauvignon and Sauvignon Blanc from Chile, Malbec from Argentina and numerous varietals from California. Different size formats—three-glass 500-ml. and party-sized three-liter boxes— add to the value proposition, as does the partially permeable bag-in-box technology that ensures the wine is as good after six weeks as it was on the first night it was poured. PHOTO COURTESY OF BLACK BOX WINES BLACK BOX WINES EXCEED EXPECTATIONS WHILE INVIGORATING A CATEGORY by Elyse Glickman In 2017, Black Box's limited edition Rosé, the eleventh product in the portfolio, was born out of rosé's exponential growth in the U.S. wine market over the past few years, including 43 percent growth last year. Innovative Thinking, Inside the "Box"